It’s July! July means that soon we’ll be drawing out of the hearty greens phase of seasonal eating, and moving into more traditional summer crops. We found a couple ripe cherry tomatoes this week, which hopefully bodes well for the start of the real harvest a month from now. And the zephyr summer squash are starting to fill out on the vines, so we should have some for you soon. If you’re a cilantro lover, don’t be dismayed by the size of this week’s small bunches. More is to come, I just wanted to give you a taste from an early small planting. Last fall’s massive garlic planting continues to produce thousands of garlic scapes. Even if you have some left over from last week, take this week’s portion, too, because they keep for weeks in a plastic bag in the fridge. Or you can chop them up and toss them in a plastic bag into the freezer. They can be pulled out and included in any sort of cooking, all year long. As for the collard greens, one of the innumerable things I’m grateful to my late friend Shannon Hunter for is that she taught me how to cook collards. I had always treated them like kale, but she taught me to cook the heck out of them. I adore them cooked following her recipe below. May you have memorable meals with the veggies in this week’s share and, as always, please be in touch questions, thoughts, or suggestions!! Row cover… the bane of the organic farmer, but also what allows us to have early, beautiful (hopefully!) and organically managed crops. The white “blankets” you see in the picture above provide both warmth and bug protection for tender crops. For the crops that bugs such as flea beetles love to munch on (arugula, the mustards in mesclun mix…) EVERY inch of edge of the row cover must be held down with dirt to keep the tiny bugs out. So there is a seemingly endless job on the farm of covering young crops with row cover (also knows as Remay), then eventually uncovering the plants to harvest, and then recovering them to keep them protected until the next harvest. 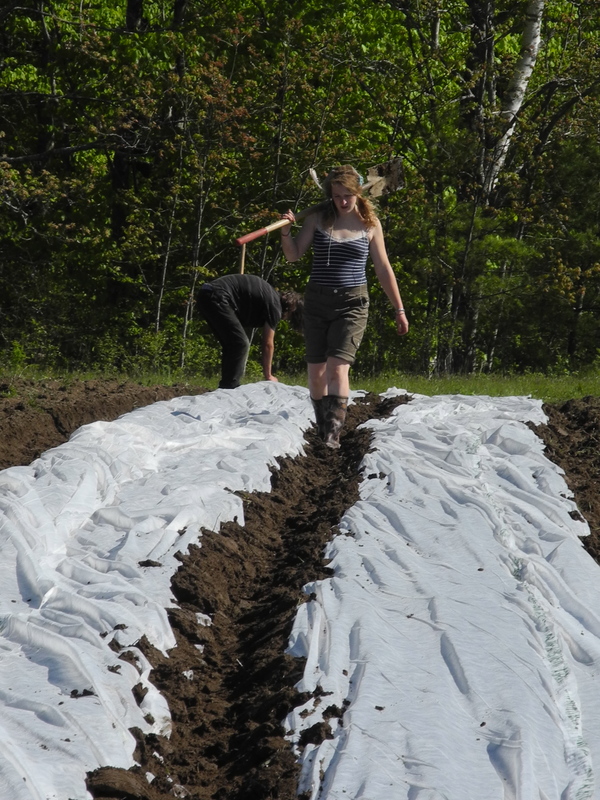 In the picture above, Laura trudges back from a completed row with a shovel on her shoulder, while Alex ensures that the ends are held down tight. Underneath the row cover is the young arugula that you will enjoy this week. Need Inspiration in the Kitchen? These cookbooks (and websites) are consulted weekly, if not daily, in our kitchen. An incredible cookbook that we turn to daily. If we have a vegetable that we don’t know quite what to do with, we just look it up in the index and go from there. Any Bittman books are worthwhile investments. These cookbooks are like magic — every single recipe is delicious! specific vegetable and create your meal around the recipe that pops up. Www.SmittenKitchen.com also has great recipes. And, of course, our website has all the recipes we’ve ever included the newsletters.